We’ve had a bit of a thing for horses lately. Now that we are house sitting for my in-laws we are enjoying a taste a of the country a bit more. And one of the things the kids love to do is go on walks to see the horses down the street. I’ve also recently worked on illustrating a horse puzzle for Crocodile Creek and I must confess that I’ve been bitten by the equestrian bug as well. So Naturally I knew we had to have a few play horses of our own…And those horses needed a place to stay…so a stable was born. Using our favorite medium of choice, cardboard + duct tape, we fashioned one up real quick, along with a few apple trees to go with. 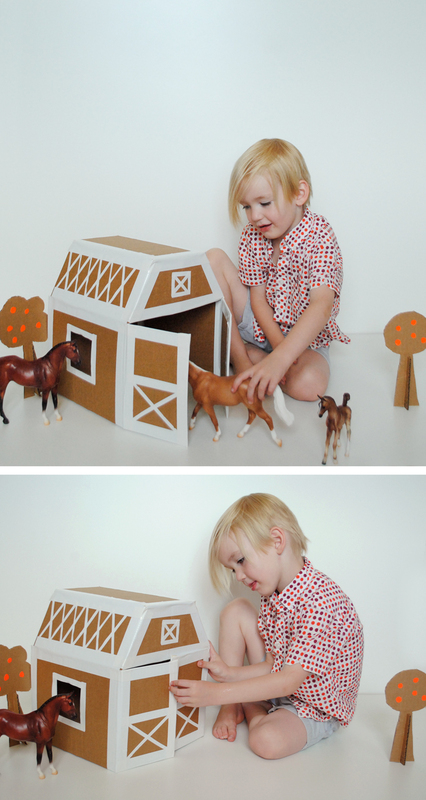 To make one yourself, simply start with a cardboard box the size you want your stable to be. Cut off the top (and bottom if you want like we did). Cut one side of the box down the middle to create the stable doors. 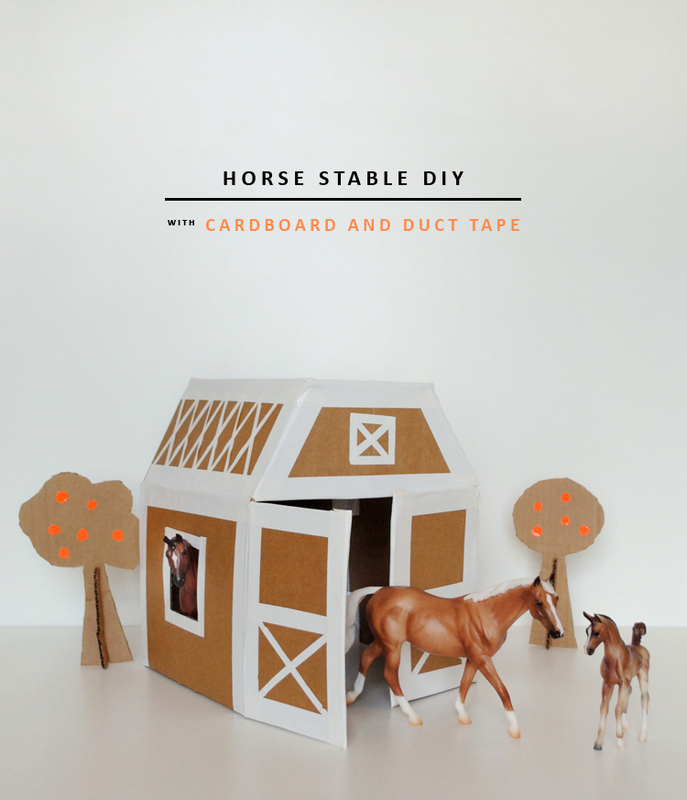 Then using other scraps of cardboard, create the top of the stable and hold in place with strips of duct tape. (See tutorial here for cutting duct tape). Feel free to add windows and decorate how you see fit. Now add a few interlocking apple trees and your horses are ready to move into home-sweet-home. This is such a cute idea! And it looks so stylish! Wonderful! Thanks Jen. trying to remedy the post hiccup. thanks for the heads up. You make the most fun things!!! I often make a mental note to do them with or for my grandkids but never think to let you know how adorable it all is – so this is me thanking you for all the great ideas and fun. You make being an awesome grandy easy.